(Nanowerk News) If you use a smartphone, laptop, or tablet, then you benefit from research in photonics, the study of light. At the University of Delaware, a team led by Tingyi Gu, an assistant professor of electrical and computer engineering, is developing cutting-edge technology for photonics devices that could enable faster communications between devices and thus, the people who use them. The research group recently engineered a silicon-graphene device that can transmit radiofrequency waves in less than a picosecond at a sub-terahertz bandwidth — that’s a lot of information, fast. Their work is described in a paper published in the journal ACS Applied Electronic Materials ("Bandwidth Limitation of Directly Contacted Graphene–Silicon Optoelectronics"). 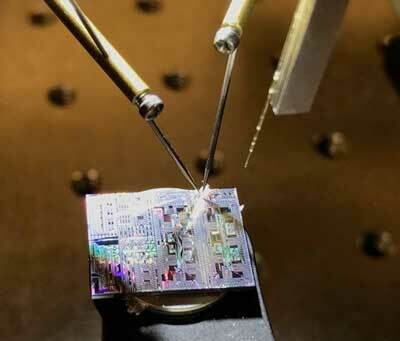 Now, Gu’s team is combining silicon with a material with more favorable properties, the 2D material graphene. 2D materials get their name because they are just a single layer of atoms. Compared to silicon, graphene has better carrier mobility and direct bandgap and allows for faster electron transmission and better electrical and optical properties. By combining silicon with graphene, scientists may be able to continue utilize technologies that are already used with silicon devices — they would just work faster with the silicon-graphene combination. To combine silicon with graphene, the team used a method they developed and described in a paper published in 2018 in npj 2D Materials and Application ("Spatially controlled electrostatic doping in graphene p-i-n junction for hybrid silicon photodiode"). The team placed the graphene in a special place known as the p-i-n junction, an interface between the materials. By placing the graphene at the p-i-n junction, the team optimized the structure in a way that improves the responsivity and speed of the device.